The PHP-powered Magento platform is a well known open source ecommerce solution for the modern web. It’s also one of the most complex PHP CMS platforms to learn. 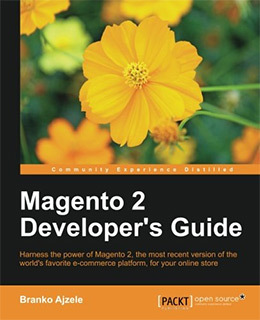 In this post I’d like to share the top 20 best Magento books for web developers. You’ll learn how to get started and what you need to practice to build prowess in Magento from building themes to plugins and mastering the administration panel. 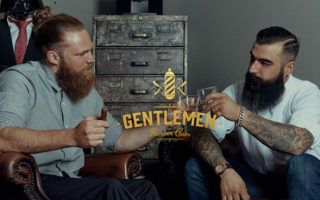 Whether you’re brand new to Magento or want to push your current skills further I guarantee you’ll find something in this post. 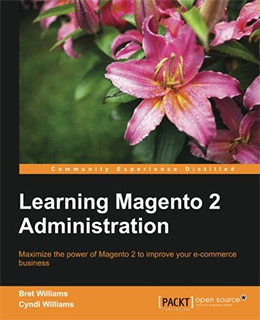 If you’ve never touched Magento before and want the best book to get started I’d recommend Learning Magento 2 Administration. This isn’t specifically a development book, however it does cover all the basics that developers should learn before diving into the code. And it covers the newest features in Magento 2.x. For a soft yet detailed introduction to Magento as an ecommerce platform I’d recommend Magento: Beginner’s Guide. This book covers 300+ pages full of guides to help you install, configure and launch a Magento site. This book takes you far beyond the basic installation by showing how to add products, handle payments, and order fulfillment all from the backend. You’ll also learn how to handle customers in your database and how to build a secure store that encourages purchases. Security is a huge part of e-commerce development and this book gets you caught up with security for Magento administration. If you have no real technical experience then this is the best book you can get. It covers every major feature about Magento without getting too technical. If you’re looking for a dirt cheap intro to Magento then you might like the 45-page Magento 2 Primer. This book covers all the newest features in Magento 2 while contrasting them against the original Magento 1.x. This book primarily targets existing Magento users who plan to upgrade to the Magento 2 framework. It is similar in many ways but also very different with new terminology and updated admin features. 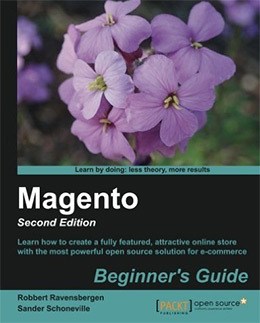 I do not think this book can take a beginner to complete competence with Magento. It’s a little too generic and there’s not enough room in 45 pages to get a novice moving with Magento’s interface. However if the cheap price tag fits and you’re OK with a general intro to Magento 2 then this book will be right up your alley. PHP developers who want to become certified Magento developers have to take the Magento Certification Exam. This tests your working knowledge to prove that you know enough about Magento to be considered an expert developer. Aside from online documentation there aren’t many resources to study from. But the Grokking Magento Book is incredibly valuable and it targets PHP developers who plan to take the certification test. This current book only has one volume but it’s expected to have another one in the near future. And it may seem rather short with only 170 pages but I’m surprised at how versatile the content really is. Since this book is meant for a PHP Magento cert it’s really a programming book at heart. 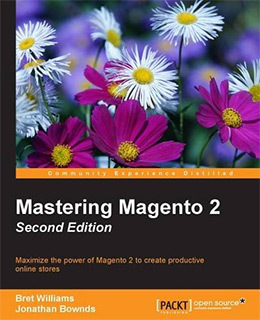 But through studying this book you’ll learn a lot about the Magento system and how it operates. I would only recommend this to developers who want to become Magento certified, or devs who just love learning about the technicals. Here’s a much more recent book that also targets developers, but teaches the content from a more laid-back perspective. In Magento 2 Development Essentials you’ll learn all the basics of Magento 2 from initial setup to detailed configuration. The book’s author Fernando Miguel has over 10 years of experience developing on the web. He shares tips for extending Magento with themes and plugins that improve SEO and mobile user experience. As the title suggests this is really a development book over anything else. You’ll learn how to build custom Magento themes, extensions, mobily-only features, and SEO techniques to get your pages ranking in Google. All of these areas cover development and you’ll need some prior PHP experience to get anywhere with this book. However if you are a complete beginner looking to develop with Magento this is a great place to start. It covers the latest version of Magento 2 and the tips are broad enough that you’ll learn everything you need to get started. It seems like e-commerce stores care a lot less with it comes to SEO and organic rankings. But these are still powerful metrics for driving sales and building a reputable customer base. Magento Search Engine Optimization is a few years old but it’s still just as relevant as ever. The author Robert Kent teaches you how to work with the default Magento config to improve SEO right out of the box. However you’ll also learn about real SEO strategies for which keywords to target and which pages to optimize. Robert explains 301 redirects, semantic schema for reviews, and how to track customer behaviors with Google Analytics. 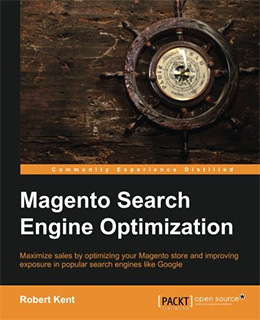 This is really an e-commerce SEO book using Magento as a testing tool. If you’re launching a new site or optimizing an existing one this SEO book is a must-have resource. Because Magento is so dense and complicated there’s not a lot of room for “best practices” without tinkering and learning on your own. Thankfully years of experienced developers have compiled their thoughts and shared tips with the Magento community. But if you don’t have time to browse around I’d recommend grabbing a copy of the Magento Best Practices Handbook. It’s pretty short at only 126 pages but the information is pure gold. You get tons of hand-made recipes for solving common Magento problems on the backend. But the author doesn’t just share random code snippets. These are tailored for Magento websites for optimization and performance. Best practices are not easy to learn and they’re even harder to follow. Thankfully this book makes it super easy to learn Magento development the right way through examples and practical guidelines. Learning Magento Theme Development teaches through practical exercises that focus on results. You’ll learn how to change color schemes, customize a site’s logo, update product image styles, and how to build your own theme from scratch. Many of these techniques work with PHP code. However you can learn a lot as you go because Magento’s PHP library is abhorrently dense. Nobody knows everything about Magento and it’s unlikely that you’ll be the first to master it. 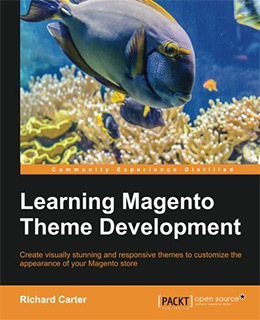 But even with very little PHP knowledge you can pick up this book and start building your own Magento themes. Just be sure that you at least have some frontend development experience and that you’re comfortable coding HTML/CSS themes from scratch. Understanding the design side of Magento is just as important as the development side. With all the newest features in Magento 2 most themes follow a similar structure with categories, product sorting, and individual product pages. 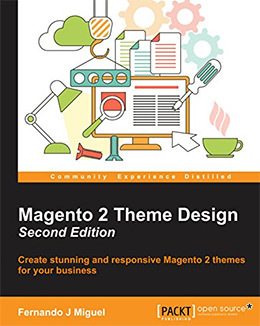 Magento 2 Theme Design is currently in its second edition with 330 pages full of design tips and strategies for magento users. This book focuses much more on design aesthetics for creating themes that fit into the Magento content mold. 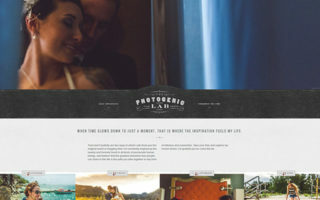 But you’ll also get advanced tips for building responsive themes and building print-ready themes. The author even goes into custom theming for the admin panel if you’re daring enough to follow along. Whether you’re editing an existing theme or designing your own from scratch this book has you covered. It touches upon some development topics but it’s mostly a UI/UX design book made for web designers. Once you’ve already built a couple Magento themes you’ll be ready for the big time. This is what you get with Mastering Magento Theme Design by Andrea Sacca. In this book you get a nice mix of design and development merging common interface trends with the backend theme development process. 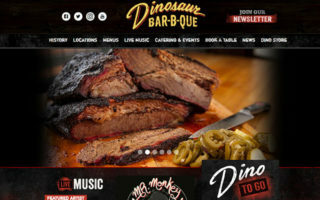 You’ll learn how to build themes on top of frameworks like Bootstrap and how to use CSS3/JS animations for common page elements like dropdown menus. You should already have knowledge in frontend development and basic Magento theme development skills. This book doesn’t get too far into the technicals of PHP for Magento theming. 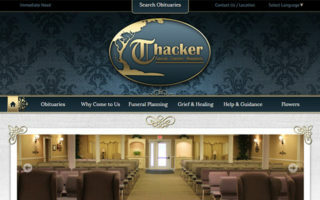 But it does cover more advanced tips for responsive theme design and updating the Magento admin panel. 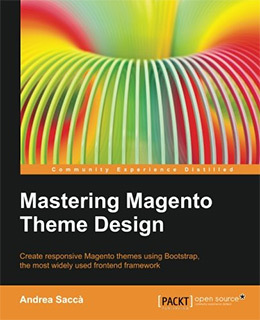 This is the perfect book to bring your Magento theming up to the next level. I think this book pairs nicely with an intro guide like Magento 2 Theme Design since you can follow one after the other with relative ease. Beyond basic theming you also have the ability to expand Magento with custom scripts called extensions. Many developers buy pre-made extensions but you can also build your own from scratch if you have the right skillset. 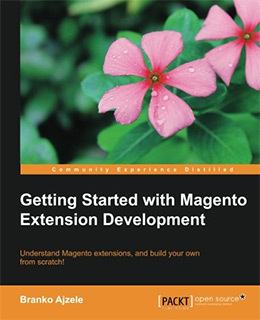 Getting Started with Magento Extension Development is a brief 130 page book covering the absolute basics of Magento extensions. The book’s author Branko Ajzele has over a decade of experience working in the e-commerce space and his writing style is very easy to follow. 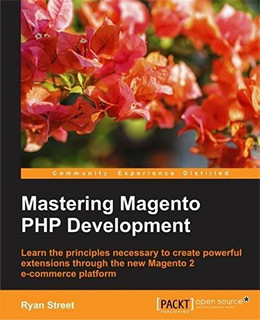 You should already have a working knowledge of Magento and PHP before picking up this book. It doesn’t cover a lot of PHP fundamentals so you’ll just dive right into extension development without any background. You’ll learn all about Magento’s different classes with Model/Controller classes as part of the MVC framework. You’ll also learn how to schedule CRON jobs that automate tasks on the server. 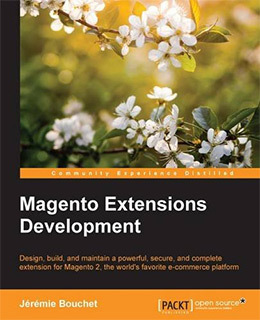 By the end of this book you should understand the basics of Magento extension development and you should feel comfortable enough to start building your own. 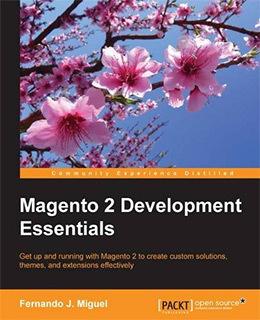 Here’s a newer extension dev book focused on the latest version of Magento. This one is a tad longer with 240 pages and much more detail looking into the newest Magento 2 features. With Magento Extensions Development you also learn about custom development cycles like test-driven development and localization for your content. The author starts off slow explaining the Magento dev environment and module/extension workflow. But you’ll quickly move into more complex topics by examining existing Magento plugins in the marketplace. If you’re looking for a book to help you build Magento modules with proper syntax and best practices then this is for you. It covers everything you could possibly need to get into Magento extensions with confidence and a clear roadmap for learning. When developers talk about optimization they’re usually referring to server load and memory usage. Smaller applications rarely have issues but a large platform like Magento can bloat quickly. That’s where a book like Magento Site Performance Optimization comes into play. This is a real short guide with only 92 pages total. But it offers very specific techniques for optimizing your MySQL database, configuring Magento caching, and even updating your server with Varnish/Memcached. This is an all-around optimization guide looking at the server environment, the database engine, and the Magento software. You’ll learn tons of practical techniques that you can apply to your own setup that will improve load times and reduce bounce rates. I do wish this book was a tad longer because it feels like there would be so much more to cover. 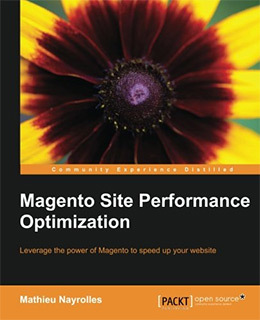 But if you’re having trouble with Magento performance and don’t know where to turn this book offers a lot. Many sites are switching over to Magento 2 for the newest features and updated security. But there’s so much to learn when developing on Magento 2 and it can be overwhelming to learn it all at once. The Magento 2 Developer’s Guide spans 400+ pages full of custom Magento development tips and techniques. This book specifically covers the latest Magento 2 features, but it’s also a nice primer for new developers getting into the Magento environment. 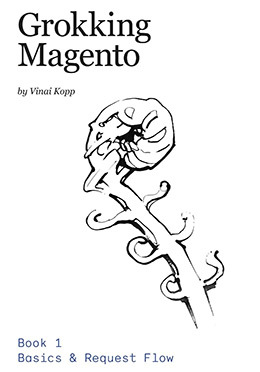 This is one of the most detailed Magento dev books I’ve ever seen. It covers the basics of theme/extension development but it also gets into the web API and backend development with cron jobs, logging, profiling, etc. You should already have some knowledge of PHP before diving into this book. It also helps a lot if you know a bit about Magento’s inner workings. But you don’t need to be a Magento expert to understand this book. It’s easily the best Magento 2 guide for developers and this will keep you busy with months’ worth of exercises to work through. Managing a custom Magento store is just as detailed as learning to build on top of the Magento platform. And with Learning Magento 2 Administration you can learn absolutely everything from initial setup to product creation and detailed user management. There are so many guides to Magento but none have this much depth or clarity. Plus this isn’t much of a technical guide so it pertains to any aspiring Magento user regardless of background. The book is only 300 pages long yet it offers a slew of tips and detailed workflows from digital/physical products to translations for multiple languages and cross-promoting products with upsells. Overall this would be my #1 recommendation for anyone just starting with Magento. It really does cover everything you need to know without the technical details. And it’s a useful book even for developers because it teaches you the Magento system first. On the flip side we have Magento For Developers which teaches the Magento platform for the sole purpose of web development. This is a much shorter book with only 135 pages in total. It reads like a training guide for large enterprise teams but it’s also valuable for freelancers and agencies that work on Magento projects. While this guide is short it’s also not meant to be incredibly detailed. Instead you get a bird’s eye view of the entire process to help you understand the typical Magento dev pipeline. Incredibly valuable for teams working together on a major Magento project. In fact that’s the only real demographic that this book works for. I do think freelancers can learn from this book’s advice, however they’d be better off going with a real development book like the Magento 2 Developer’s Guide. This is the ultimate Magento book for everyone from webmasters to marketers and designers/developers. Mastering Magento 2 covers the newest features of Magento in 340 pages spanning the gamut of Magento administration to theme development and security. You’ll learn how to install Magento 2 from scratch along with basic configuration methods. 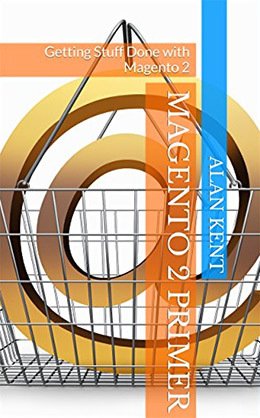 The book also teaches how to manage products in the shop, how to add extensions for marketing, and how to optimize your Magento installation to run smoothly on your server. Later chapters get into more advanced techniques for developers and administrators who want to build very large e-commerce shops. Handling payment often means a payment gateway for multiple currencies, or working with an intermediary like PayPal. You’ll learn both methods and how to scale your operations as the site grows. In all regards this truly is a book made for mastering Magento. You do not need any prior experience but it helps a lot if you’ve already done stuff with Magento 1.x before getting this book. Likewise if you’re pushing into Magento 2 development then you’ll want an updated guide that can push you beyond your limits. Mastering Magento PHP Development teaches how to build custom Magento 2 themes and extensions with the latest features and design patterns. You’ll learn all about Magento events and how to build customized features on top of the Magento 2 platform. These include new features in the product catalog listing which can be updated in your theme or with an extension. The author Ryan Street is a Magento developer with 8 years experience in PHP/LAMP environments. His tips echo beyond the traditional Magento concepts to push you into real customization for detailed e-commerce projects. You’ll learn about shopping cart cookies, basic marketing techniques, and various API interfaces you can use to hook into the Magento codebase. Overall this is the perfect Magento dev book for intermediate-to-advanced developers who want to go far beyond the basics. I know the title of this book seems fairly outdated but the actual content is still just as relevant as ever. 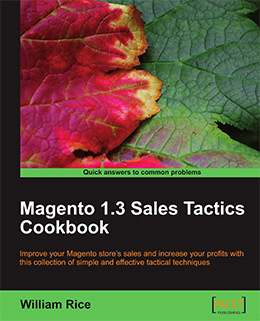 The Magento 1.3 Sales Tactics Cookbook covers 300 pages full of recipes, solutions, and techniques for SEO and marketing. You’ll learn how to customize your Magento store to improve clickthroughs and streamline the checkout process. Everything about marketing in Magento really boils down to certain tools and strategies. 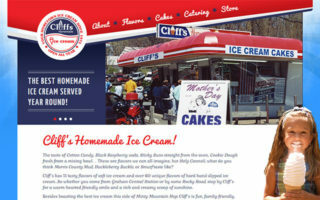 There are some code-based recipes but many of them offer strategies for Magento shop owners. All of these custom recipes work great for Magento 2+ and you can refactor them for your own purposes. 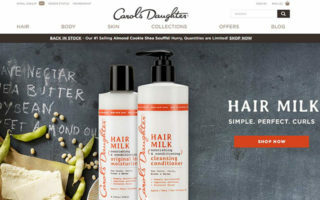 You’ll learn how to build coupon codes, freebies for giveaway contests, and offer upsells right within the product page. These recipes are valuable to any shop owner and I would highly recommend this book to serious Magento users. 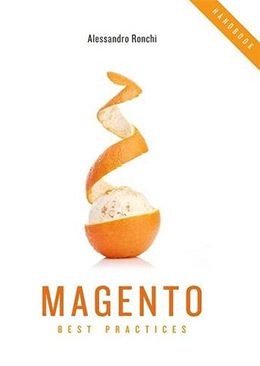 It makes sense that with the latest version of Magento we’d also get a new cookbook. With 342 pages you’ll get dozens of recipes for extending store functionality, improving security and performance on the server. 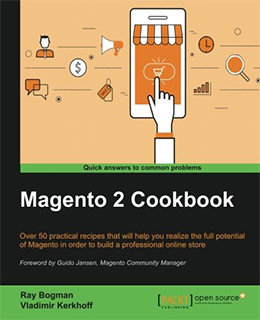 The Magento 2 Cookbook offers solutions that improve the current Magento 2 environment. You’ll learn how to scale features for smaller stores and how to customize categories, product listings, and sorting options. And the newer Magento 2 framework gives developers a whole new set of tools for theme development. 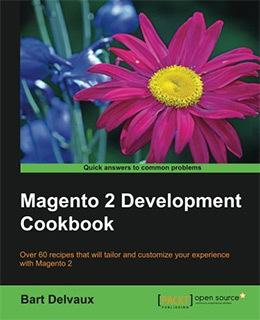 This cookbook has recipes for every part of Magento 2 from administration to server management and theme development. 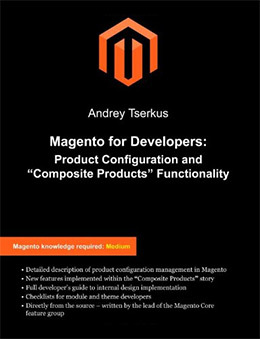 I would highly recommend this book to professional Magento developers who want a desk reference or solution guide for their most common problems. Once you’re already comfortable with the basics of Magento this cookbook will help you push even further to build some real cool features. Once you get deep into Magento 2 then you’ll probably want the Magento 2 Development Cookbook as a reference guide. The book offers 300 pages filled with over 60 unique recipes for developers. This is a code-heavy book and every recipe offers common solutions for features like product search, user management, and checkout security. You’ll also learn how to extend pricing and shipping with custom modules built around the Magento 2 codebase. Other detailed recipes cover bug testing for new features before launching them live. This is crucial for larger e-commerce shops that needs to check for bugs and errors before putting anything live. E-commerce projects need to put security first. Thankfully this cookbook realizes the importance of security and offers handy tips with each recipe. This book pairs brilliantly with the prior Magento 2 cookbook and they both make excellent desk references for pro developers. There is no absolute best course for learning Magento and everybody learns at their own pace. Some people want to improve their Magento site’s SEO while others want to build custom extensions. If you’re completely new to Magento with no prior experience I’d recommend Learning Magento 2 Administration as the most detailed introductory guide. From there you could move onto any number of books covering Magento theming, extension development, optimization, or one of the many awesome Magento cookbooks. With so many great titles to pick across all skill levels you basically have unlimited Magento resources at your disposal. Alex is a fullstack developer with years of experience working in digital agencies and as a freelancer. He writes about educational resources and tools for programmers building the future of the web.